INDULGE IN A DISTINCTIVE WHOLESOME SOURDOUGH TOASTIE COMPLIMENTED BY DELICIOUS CHUTNEYS. The Toasty Badger was started in 2018 by Kim Gourd. She was born and bred in the west country from South Devon and is now living the busy life in London. Kim has spent the last 14 years of her working life dedicated to nursing but has now been inspired to become creative and start a daring new venture with a pop-up kitchen. Since July 2018 we have catered for many different markets and events, such like, Deptford Bites, Eats on the Streets, Wild Child Festival, Crystal Palace Firework Night, Knebworth Winter Festival and Walthamstow Winter Market and since, The ‘Toasty Badger’ has always been a talking point! 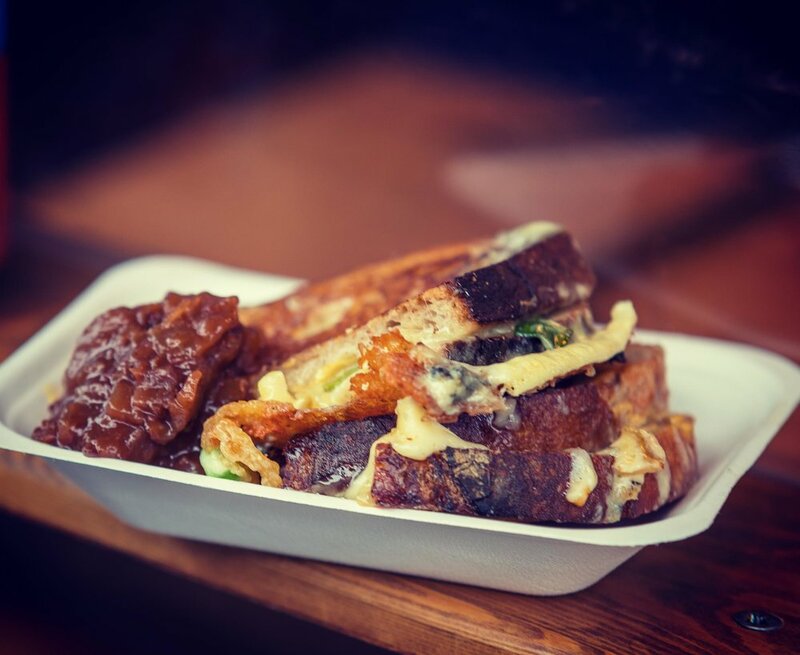 Kim’s aim is to create 'A Toastie like no other' by using the best ingredients all sourced solely from the UK. Our award-winning organic sourdough bread has zero additives and preservatives and is guaranteed to fill you up! We also have a gluten free sourdough bread and a vegan option on our menu. You can choose from three different wheels of cheese, Cheddar, Blue Stilton and Brie. The toasties we serve all come with other healthy ingredients such as rocket, red onion, spinach, flat mushroom and chives. These toasties are suitable for vegetarians and vegans. And what better way to compliment these wholesome toasties but with a dobble of delicious chutney. You can choose from our Spicy Tomato and Caramelized Red Onion. The chutney is subject to change. We use biodegradable trays, cutlery and cups to serve our customers to keep it green. Sourdough is a culture of yeasts and beneficial bacteria that occur naturally in bread flour and dough. The yeasts are more varied and less concentrated than other yeasts, so the dough is raised more slowly. The lactic acid bacteria also requires many hours of fermentation to work their wonders. Sourdough is more digestible than standard loaves and more nutritious too. Lactic acids make the vitamins and minerals in the flour more available to the body by helping neutralise the phytates in flour that would interfere with their absorption. Sourdough is easier to digest, improves gut health, has prebiotic and probiotic-like properties and has better effect on blood sugar levels making sourdough a good bread for people with diabetes. Choose Sourdough! Allergens - Our sourdough is baked in a artisan bakery so all sourdough may be affected by cross-contamination with nuts and seeds. Slow cooked red peppers & red onions in spices, spinach with black olive lemon puree. Use the form to send us over your specific query or requirements. We look forward to hearing from you!